I wrote a post a while back, Where Does Your Food Come From, where I discussed having watched the food manufacturing industry explosive documentary Food, Inc. and how it changed the way I look at and buy food, primarily meat and diary. Now I'm no vegetarian and I particularly like the occasional burger (if you are ever in New York City, head down to SoHo and go to a little cafe restaurant called Ruby's and order the Bronte Burger - it will be the best burger you have ever tasted). But did you know that 80% of the beef we eat here in the United States comes from only four companies? And that because of an artificial grain fed diet that beef has been pumped with antibiotics and chemicals? Doesn't sound appetizing now does it? What's even worse is today it has been reported that there has been another beef recall here in the United States because of an E.Coli outbreak that has made people sick. What causes that? You can read about it here. Well today I'm going to show you how you can change all that. Today you can do something about it and as a consumer now have an opportunity to tell the FDA (U.S Food and Drug Administration) exactly what you think about that. 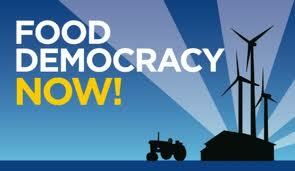 A new organization called Food Democracy Now has been launched to fight back against the large food manufactures, and who are dedicated to bringing back a sustainable food system that protects our environment and your health. They have launched a campaign where you can send an email letter directly to the FDA telling them you do not want antibiotics in your meat. The letter has already been written for you, all you have to do is add your name and it takes two seconds. Click here to sign the petition, and use your power as a consumer to have a say in how your food is manufactured.